Europe’s top industry experts will share insights into their safety and quality projects. You’ll hear real-life case studies from leading Food and Beverage companies who you’ll be able to discuss your challenges with. There’ll also be regulatory updates from the authorities and academics at the cutting-edge of microbiological pathogen studies sharing their discoveries. 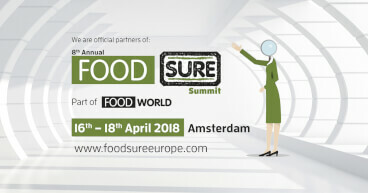 The Food Sure Summit 2018 in Amsterdam on April 16th features two keynote speakers from Omron. Faouzi Grebici, Industry Solutions Manager EMEA and Barry Graham, Field Sales Engineer - Robotic Solutions. Today, one of our two speakers, Faouzi Grebici shares some insights from his session, entitled ‘Autonomous and Intelligent Manufacturing: A Game Changer in Fresh and Personalized Food’. What do you do in your day-to-day role and what are your biggest challenges? First, we establish a coherent strategy to share with the industry in general and manufacturing in particular, today and tomorrow. My role is to connect with deciders in those target industries by not only understanding them – sometimes, understanding is too late – but also confirming the market dynamics that we are seeing and they are experiencing. This means to connect on a level where we share the same vision of manufacturing. If we talk about 15 years ago, the trendsetters were the ones making the machines and food manufacturers were considered as users. These trends are significantly evolving, and manufacturers are in need to connect with core technology providers to respond to growing challenges. There are so many changes in food standards and norms, consumer behaviour, globalisation and as consequence the market dynamics is ten to 20 times faster than in the past. Therefore, we have now to reach out to the customers of our customers all the way down to food manufacturers to understand what, are the technologies available to them to help them shape up the future. Where do you see the industry going in the near future? Food trends have been evolving, but the mass production model needs to change alongside this. Some food will be in and out of fashion very quickly, which is what we are witnessing today. Not so long ago, in the south of Europe, lunch was an institution, but now food on the go is the everyday and people want more and more personalised things. So, what people want has evolved, but the production model hasn’t caught up and it is still designed for mass production. Therefore, we propose a more flexible, autonomous and intelligent model to address this market dynamics. There are two things at (least) which need to be addressed in the food industry. The first, in my opinion, is the food waste. There are 1.3 billion tonnes of food wasted worldwide every year. In terms of value, this is close to 1 trillion dollars. 70% of this is wasted at the production and distribution stage, and close to 30% is wasted by the consumer. Ideally the best way is to make food as close as possible to the consumer. The manufacturer’s processes need to adapt to that. The second part is time to market for the food manufacturers. As the demand is very dynamic and trending is scattered in terms of gender, age, allergies, regional tastes, seasons and life style etc. Forecasting demand and planning new products becomes a real headache for food manufacturers. How can they adapt to these changes, more importantly how can they be sure that they’re investing in the right next thing? The usual approach is investing in big consumer surveys and market research to link up to the consumer taste and experience. Minimising risks and ensuring highest return on investment means usually heavy planning and forecasting. Biggest delay to market and consequently long time to market is not always due to the development and the production but to the heavy planning around it. If, however, we are flexible, nimble and make it easy to deploy/redeploy/relocate/reuse production lines, they can be scaled up or scaled down dependent on actual sales. Having a linear scalability between your sales and your investment and machinery by breaking up these big lines into smaller functional cells – this will help reduce the time to market. What solution does your session offer? It's not about a solution – it’s about an exchange and a proposal. All-encapsulated and universal solutions just don’t exist. It’s about the value chain that includes the technology provider, the machine builder, the production side and the consumer. It is very important to talk about extended value chain because now the technology might allow it. This is what we offer in this model of autonomous and intelligent manufacturing. This consists of the three basic functions of 1) transforming – basically packaging, filling, sealing 2) transferring and 3) transporting all in an integrated and scalable way. What do you like most about events like Food Sure? Food Sure is about exchanging ideas and if people are sitting in a session thinking ‘mmm, I didn’t think about that’, that’s already a success, even if they don’t immediately apply it. I would say that my favourite part is the few minutes after the talk, it is there where one can gauge the reaction of the audience. The exchange and networking are more natural when the attendees connect with you on the chosen subject. Again, not necessarily on getting a solution but at least questioning the status quo. We present a novel approach and with this we try to promote the competence and the image of our company but let’s not forget that the other purpose is to learn. ‘Learning’ often sounds overused but it really is the point – to be able to put an idea or a concept and be able to get sound feedback from top and knowledgeable people in a major event like FoodSURE is key. Find out more about Faouzi Grebici’s session, entitled ‘Autonomous and Intelligent Manufacturing: A Game Changer in Fresh and Personalized Food’, in the programme.